Rinse the chicken and pat dry. Place the chicken in a heavy bag and set in a large bowl. In a small pot, heat the olive oil over low heat. Add the whole crushed garlic cloves to the oil and cook for 5 minutes. Remove from the heat and let the oil stand until cool. Remove the garlic from the cooled oil and discard. Combine the oil, paprika, piri-piri sauce, lemon juice, and the salt and pepper. Pour over the chicken, turning to coat, then close bag and refridgerate overrnight, turning several times. Let stand at room temperature for 1 hour prior to cooking. Preheat the oven to 350°F Remove the chicken from the marinade. Place the chicken in a roasting pan with a rack inside. Pour the marinade over the chicken then add the water to the pan. Bake in the oven, basting regularly for approximately 75 - 90 minutes, or until a meat thermometer registers 185°F (add a bit more water if sauce gets dry). Remove the chicken from the oven and let rest for 5 minutes. Strain the marinade from the pan and serve with the chicken. 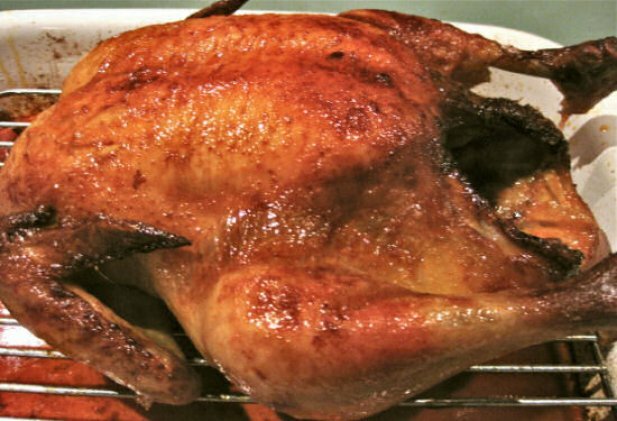 ***Alternatively, the chicken can be placed on a rotisserie rod with a drip pan placed below and slightly in front of the bird to catch any drippings and prevent flare-ups as the bird rotates. Add the remaining marinade and water to the drip pan. 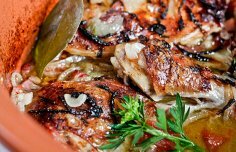 Grill the chicken on a medium-high setting, brushing often with the marinade. Barbeque for approximately 75 minutes, or until the meat thermometer registers 185F***. 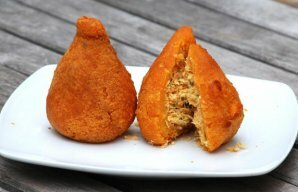 These delicious Brazilian fried chicken croquettes (coxinhas) are a very popular street food in Brazil. There is nothing better than a delicious roast chicken dinner, and this Portuguese roast chicken and potatoes recipe makes a great meal for the whole family. This delicious meal is perfect with roasted potatoes or rice.